"bohemian pilsner". a little redundant, maybe? patagonia bohemian pilsner? lolwtf. Czech pilsner is better, as in Pilsner Urquell. Not sure if you mean that Urquell is better than the two knock-offs going at it here, or if you mean that Czech pilsner is better than Bohemian Pilsner in general. Well, Pilsner Urquell has, at times, been rated one of the five best beers in the world. I would concur with that. That there was a Bohemian region of the Czech republic was beyond my ken, thanks for informing me. I hope the fleas of a thousand camels infest the armpits of Anheuser-Busch's executive and legal teams. Also, I hope they owe a bajillion dollars to Patagonia for this. Considering that companies do change their branding and graphics on a whim these days, it would be easy to assume that one of the companies has decided to try alternative branding for a while. So, yes, I think a novice (or inebriate) could be confused/tricked by the graphics. The clothing maker has never been using that trademark for beer; It only started making a beer 3 years ago (under a different trademark). How you're proposing InBev knew in 2012 that a highly niche clothing manufacturer (I had never heard of them until this broke) was going to start making beer in 2016 is beyond me. They couldn't. BUT, when they started selling clothing outside ski shops selling Patagonia clothing, they knew exactly what they were doing. Sure, they probably didn't know Patagonia would enter their market. They probably just registered ALL THE TRADEMARKS and then sat on them, not making use, so if some competitor decided they wanted to enter the market InBev had a weapon to deploy. That's NOT the purpose of trademark. Hoisted on their own brewtard. With any luck, patagonia will trounce them. I'm definitely confused by this branding, so...Yeah. Techdirt will certainly be declared a terrorist organization. Governments hate being exposed. The clothing company's beer branding appears sufficiently different that there should be little confusion. "Long Root" !~ "Patagonia". It may even be not unfair to allow the big beer company to use the latter name in the realm of beer. On the other hand, now that they are selling merch, there could be confusion. 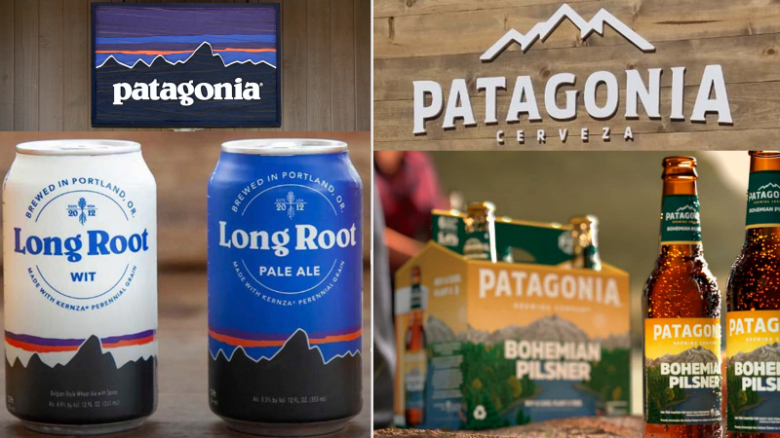 "Patagonia" == "Patagonia", so using the branding to designate the origin of clothing is confusing. Assuming always that more money gives rise to legal victory, we can predict the result. Is the author of this article a lawyer? The people of Patagonia (the region) should sue them both for making their mountains et al look bad. I get it; Big Company, Bad, Small Company, Okay. I happen to agree that this is a pretty blatant trademark problem. But a while back you wrote about a very similar trade-dress complaint. There, it was Nestle going after a company that made a "FitCrunch" bar, using an identical red/white/blue color scheme (seriously, it looks like they used the same Pantone numbers), the word "Crunch" in gigantic red letters, and it was a competing candy bar, and your conclusion was that the trade dress wasn't, and I quote, "remotely identical". So when it's a hippy-dippy clothing company vs. a huge beer conglomerate, it's a legit claim, but when it's an even clearer case and it's a huge food conglomerate vs. a small producer, it's The Mighty Boot of Corporate Overreach.